Rustlewood…a step back in time. Weathered shingles, greyed by decades of sand and sun, adorn this classic old home. Tucked away in a quiet neighborhood of Arch Cape, Rustlewood sits ocean front, though an expanse of lush greenery sits between the house and the shore. Step along a short path to the ocean, and there you will find a wooden swing that gives you sweeping views of the entire beach. This much-loved home is an elderly beauty, although her beauty is to be found in her spirit more so than her physical self. Rustlewood has not been remodeled, which – to those that love her – is a blessing. Please be prepared, however, for rustic charm and comfort. 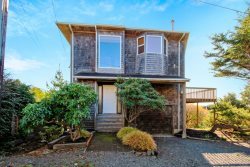 This three-bedroom, one bath home has a large glassed-in front porch, perfect for those sometime not-so-sunny coastal days. After a day on the beach, warm yourself on the swinging couch set right in front of a wonderful rock fireplace. One bedroom with a Queen bed is on the main floor, while upstairs you will find two bedrooms, each with two twin beds and views of the ocean from the window seats. Please note the stairs are crazy steep but loads of fun for energetic kids! Rustlewood’s yard is large, with a BBQ for outdoor dining – perfect for kids and dogs (Yes! Rustlewood is dog-friendly). Relax, explore, and leave the “real world” behind. Rustlewood…it’s time to come home. Absolutely loved it! We will definitely be back. The team is absolutely fantastic to work with. They made it so easy to secure a last-minute reservation and were very helpful, especially after one of us left a briefcase at the cottage, only to discover the oversight after returning to Portland. They went to the property, saw the briefcase and arranged its return to us. I will be back! It really was an amazing place. PS: please feel free to use my comments, but not my name, as I have family up the coast and they didn't know I was local. Every staff was accommodating and even worked with us after hours when we had question about using the indoor fireplace. Property was very rustic which we love. Thanks for our very own mugs and coffee which we enjoyed very much while walking the beach in the morning. My girls loved this place and our dog didnt want to leave. Ms.Sally is wonderful to work with. We love Russelwood. This was our third stay there in the last three years. This house will be our family's yearly vacation spot. We love the rustic charm and the direct access to the beach. The kids love having bedrooms with a great view of the ocean, and the fireplace was a welcome destination after a day of hiking and playing on the beach. The semi-secluded location makes it feel almost as if we had our own private beach.